Following the Commonwealth Day Youth Event, Meghan, Duchess of Sussex changed for the interfaith service at Westminster Abbey with other members of the royal family in honor of Commonwealth Day on Monday (March 11) in London. Wearing her second Fall 2019 look of the day; on this occasion she opted for British designer Victoria Beckham. The 70s-inspired chain print dress was styled with a Jackie O inspired pillbox hat – which I’m sure many of you will enjoy – along with a Victoria Beckham cream coat, plus complementary green accessories from the designer. This look is so chic, and so well put together, plus I love that green was the colour theme of the day. 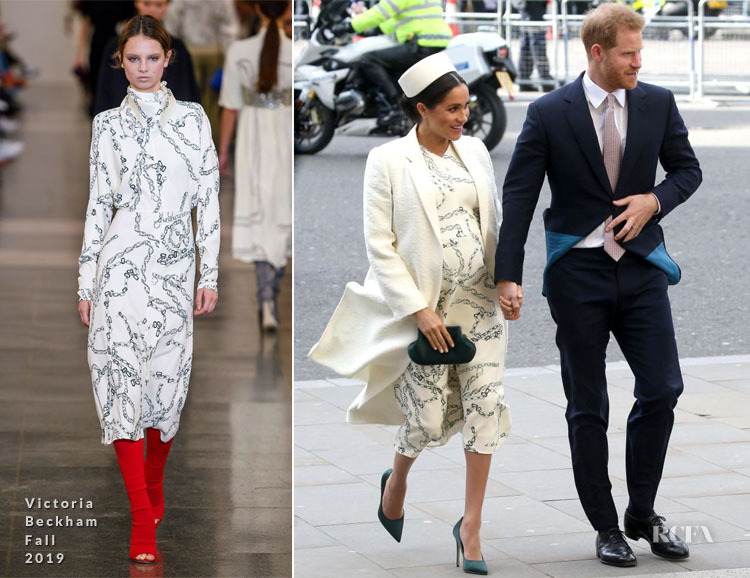 She’s come a longway….oh the things we have seen… but I finally feel that her team have got a firm understanding of this royal dressing malarkey.